I'm all about saving money and not spending even a dollar on something little or something that won't be used, but I'm also all about giving yourself small gifts. I also love getting things in my mailbox. 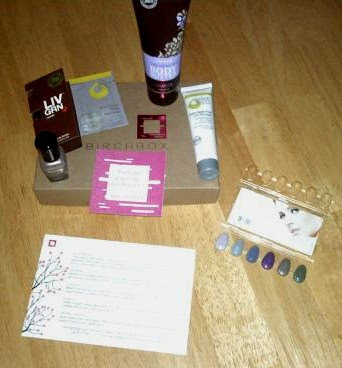 Ladies, if you've never heard of "BirchBox," you need to check it out. For the past couple months, I've been paying $10/month and receiving a fun little gift in the mail. It's a cute little box filled with 5 or 6 samples of different beauty products, wrapped up nicely and tied with a bow. It even comes with a note to explain everything I'm getting! This month I got this awesome piece of handmade paper that can be planted into the ground for it to grow into flowers! REAL LIFE! I also got some nail polish, a moisturizing peel, Zoya nail polish, body butter, and a perfume sample! It's a cheap monthly bill, and it's an awesome day when you get this unknown present in the mail. It's kinda like a secret admirer is sending you some love. I love it, and I really think you would do! Dooo ittttt.